BODY OR AGAINST LEGAL COUNSEL FOR THE PUBLIC BODY TO DETERMINE ITS VALIDITY. The City of Benton is in the middle of the process of changing out the meter reading system. This has resulted in some routes being estimated and some routes have more days than usual on their bill. This will be solved once all of the meters have been changed. With any change, issues pop up. We currently are having some issues between the reading system and the billing system on a few accounts, as some of our customers have unfortunately experienced. PLEASE DO NOT PANIC! Please give us a call and let us know if you have any issues and we will work through them together. Our Billing Clerk is working diligently to get the issues resolved as quick as possible. The City of Benton appreciates our customers and your understanding during this time of transition from our old system to the new. We believe this is going to be a positive move for the citizens as well as the city. Rescheduled Regular Meeting Agenda — TUESDAY February 26, 2019 @ 8:30 a.m.
Posted on February 20, 2019 by Brook Craig | Comments Off on Rescheduled Regular Meeting Agenda — TUESDAY February 26, 2019 @ 8:30 a.m. Comments Off on Rescheduled Regular Meeting Agenda — TUESDAY February 26, 2019 @ 8:30 a.m. ATTENTION: Benton water customers along North Franklin Drive will have their water temporarily shut off for approximately two hours this morning for hydrant valve repairs. A boil water order will immediately be issued for Franklin Drive until further notice. COMMISSIONER MILLER MADE A MOTION TO APPROVE THE MINUTES OF THE AUGUST 27, 2018 REGULAR BENTON CITY COUNCIL MEETING. SECOND BY COMMISSIONER STOREY. VOTE WAS TAKEN. YEAS: 5. COMMISSIONER MILLER, COMMISSIONER STOREY, COMMISSIONER WYANT, COMMISSIONER BAUMGARTE, AND MAYOR KONDRITZ. NAYS: 0. COMMISSIONER BAUMGARTE MADE A MOTION TO APPROVE PURCHASE ORDER #001144 TO VANDEVANTER ENGINEERING FOR 1 FLYGT NP PUMP IN THE AMOUNT OF $15,539.00. SECOND BY COMMISSIONER WYANT. VOTE WAS TAKEN. YEAS: 5. COMMISSIONER MILLER, COMMISSIONER STOREY, COMMISSIONER WYANT, COMMISSIONER BAUMGARTE, AND MAYOR KONDRITZ. NAYS: 0. COMMISSIONER WYANT MADE A MOTION TO APPROVE ORDINANCE #18-13 FOR THE SPEED LIMIT ON SHERIDAN DRIVE FROM CARLTON TO NORTH OF THE DEAD END ON SHERIDAN DRIVE TO 20 MPH. SECOND BY COMMISSIONER STOREY. VOTE WAS TAKEN. YEAS: 5. COMMISSIONER MILLER, COMMISSIONER STOREY, COMMISSIONER WYANT, COMMISSIONER BAUMGARTE, AND MAYOR KONDRITZ. NAYS: 0. COMMISSIONER WYANT MADE A MOTION TO APPROVE ORDINANCE #18-14 MAKING THE NORTH SIDE OF MCKENZIE FROM KENNETH TO SOUTH MCLEANSBORO STREET A NO PARKING ZONE DURING SCHOOL HOURS (7 A.M. TO 4 P.M.). SECOND BY COMMISSIONER BAUMGARTE. VOTE WAS TAKEN. YEAS: 5. COMMISSIONER MILLER, COMMISSIONER STOREY, COMMISSIONER WYANT, COMMISSIONER BAUMGARTE, AND MAYOR KONDRITZ. NAYS: 0. COMMISSIONER WYANT MADE A MOTION TO DIRECT ATTORNEY MALKOVICH TO PREPARE AN ORDINANCE MAKING THE WEST SIDE OF FRANKLIN STREET A NO PARKING/TOW AWAY ZONE FROM BAILEY LANE NORTH TO PARK STREET. SECOND BY COMMISSIONER BAUMGARTE. VOTE WAS TAKEN. YEAS: 5. COMMISSIONER MILLER, COMMISSIONER STOREY, COMMISSIONER WYANT, COMMISSIONER BAUMGARTE, AND MAYOR KONDRITZ. NAYS: 0. COMMISSIONER WYANT MADE A MOTION TO DIRECT ATTORNEY MALKOVICH TO PREPARE AN ORDINANCE FOR THE PLACEMENT OF STOP SIGNS AT THE INTERSECTION OF MUNDELL DRIVE/CARDINAL DRIVE AND SKIERS RUN FOR NORTH AND SOUTH BOUND TRAFFIC. SECOND BY COMMISSIONER STOREY. VOTE WAS TAKEN. YEAS: 5. COMMISSIONER MILLER, COMMISSIONER STOREY, COMMISSIONER WYANT, COMMISSIONER BAUMGARTE, AND MAYOR KONDRITZ. NAYS: 0. COMMISSIONER WYANT STATED THAT THE OIL AND CHIP PROGRAM IS UNDERWAY. COMMISSIONER WYANT ALSO STATED THAT THE DITCH BEHIND TONY LANG’S PROPERTY ON BOND STREET HAS BEEN REPAIRED. COMMISSIONER STOREY MADE A MOTION TO APPROVE PURCHASE ORDER #001988 TO STATEWIDE TIRE FOR A SET OF FOUR (4) FIRESTONE FIREHAWK GT TIRES IN THE AMOUNT OF $543.36. SECOND BY COMMISSIONER WYANT. VOTE WAS TAKEN. YEAS: 5. COMMISSIONER MILLER, COMMISSIONER STOREY, COMMISSIONER WYANT, COMMISSIONER BAUMGARTE, AND MAYOR KONDRITZ. NAYS: 0. COMMISSIONER STOREY MADE A MOTION TO APPROVE RESOLUTION #18-09 FOR A ROAD CLOSURE DURING THE BENTON FALL FEST ON OCTOBER 27, 2018 FROM 3:30 P.M. TO 7:30 P.M. DISCUSSION WAS HELD REGARDING THE REASON FOR CLOSING THE SQUARE AND IT WAS CONCLUDED THAT THE SQUARE SHOULD BE CLOSED FOR SAFETY CONCERNS. MR. KEN BURZYNSKI ASKED IF HE COULD ASK A QUESTION AND WAS TOLD HE WOULD HAVE TO WAIT FOR THE PUBLIC COMMENTS SECTION OF THE MEETING TO DO SO. VOTE WAS TAKEN. YEAS: 5. COMMISSIONER MILLER, COMMISSIONER STOREY, COMMISSIONER WYANT, COMMISSIONER BAUMGARTE, AND MAYOR KONDRITZ. NAYS: 0. COMMISSIONER STOREY MADE A MOTION TO MOVE FORWARD WITH FINANCING THE SOUTHERN ILLINOIS DRUG TASK FORCE PROGRAM. SECOND BY COMMISSIONER MILLER. VOTE WAS TAKEN. YEAS: 5. COMMISSIONER MILLER, COMMISSIONER STOREY, COMMISSIONER WYANT, COMMISSIONER BAUMGARTE, AND MAYOR KONDRITZ. NAYS: 0. COMMISSIONER MILLER MADE A MOTION TO APPROVE MONTHLY BILLS IN THE AMOUNT OF $209,280.34. SECOND BY COMMISSIONER WYANT. VOTE WAS TAKEN. YEAS: 5. COMMISSIONER MILLER, COMMISSIONER STOREY, COMMISSIONER WYANT, COMMISSIONER BAUMGARTE, AND MAYOR KONDRITZ. NAYS: 0. COMMISSIONER MILLER MADE A MOTION TO APPROVE PAYROLL PAYABLE SEPTEMBER 9, 2018 FOR THE GENERAL FUND IN THE AMOUNT OF $58,642.73 AND WATER AND SEWER IN THE AMOUNT OF $27,117.51 FOR A TOTAL PAYROLL OF $85,760.24. SECOND BY COMMISSIONER BAUMGARTE. VOTE WAS TAKEN. YEAS: 5. COMMISSIONER MILLER, COMMISSIONER STOREY, COMMISSIONER WYANT, COMMISSIONER BAUMGARTE, AND MAYOR KONDRITZ. NAYS: 0. COMMISSIONER MILLER MADE A MOTION TO APPROVE A SEWER ADJUSTMENT FOR MARK BENNETT OF 207 WEST MITCHELL STREET AS IT MEETS THE CRITERIA SET FORTH IN THE ORDINANCE. SECOND BY COMMISSIONER STOREY. VOTE WAS TAKEN. YEAS: 5. COMMISSIONER MILLER, COMMISSIONER STOREY, COMMISSIONER WYANT, COMMISSIONER BAUMGARTE, AND MAYOR KONDRITZ. NAYS: 0. COMMISSIONER MILLER MADE A MOTION TO SET “TRICK OR TREAT” HOURS FOR THE CITY OF BENTON FOR OCTOBER 27, 2018 FROM 5 P.M. TO 8 P.M. SECOND BY COMMISSIONER BAUMGARTE. VOTE WAS TAKEN. YEAS: 5. COMMISSIONER MILLER, COMMISSIONER STOREY, COMMISSIONER WYANT, COMMISSIONER BAUMGARTE, AND MAYOR KONDRITZ. NAYS: 0. COMMISSIONER MILLER MADE A MOTION TO APPROVE RESOLUTION #18-10 RESTRICTING THE OUT OF TOWN SURCHARGE ON WATER BILLS TO PAY FOR INFRASTRUCTURE OUT OF THE CITY LIMITS. SECOND BY COMMISSIONER BAUMGARTE. VOTE WAS TAKEN. YEAS: 5. COMMISSIONER MILLER, COMMISSIONER STOREY, COMMISSIONER WYANT, COMMISSIONER BAUMGARTE, AND MAYOR KONDRITZ. NAYS: 0. MAYOR KONDRITZ STATED HE HAD NO BUSINESS FOR TONIGHT. UNDER OLD BUSINESS, COMMISSIONER MILLER STATED THAT A BLUE PRINT FOR THE NEW AIRPORT TERMINAL HAD BEEN RECEIVED AND COULD BE VIEWED IN THE MAYOR’S OFFICE IF ANYONE WAS INTERESTED. UNDER MATTERS FROM THE PUBLIC AUDIENCE, KEN BURZYNSKI STATED THAT HE FELT THE COUNCIL HAD NOT FOLLOWED ROBERT’S RULE OF ORDER BY NOT ALLOWING HIM TO ASK A QUESTION DURING THE MEETING BEFORE THE COUNCIL ON A MOTION. MR. BURZYNSKI STATED THAT CLOSING THE SQUARE TOOK BUSINESS AWAY FROM HIS SHOP AS WELL AS THE OTHER BUSINESSES. HE STATED THAT HE BELIEVED THERE WERE BETTER PLACES TO HOLD THE FALL FEST THAN THE SQUARE. MRS. CARMEN BURZYNSKI SUGGESTED THE PARK WOULD BE A BETTER LOCATION FOR FALL FEST. CATHY GARAVALIA STATED THAT SHE BELIEVED THE SQUARE GAVE THE FALL FEST A QUAINT FEELING AND SHE PERSONALLY ENJOYED HAVING THE FESTIVAL ON THE SQUARE. ATTORNEY MALKOVICH ASKED THE COUNCIL MEMBERS IF ANYONE WOULD LIKE TO RECONSIDER THEIR VOTE ON CLOSING THE SQUARE. NO COUNCIL MEMBERS WANTED TO RERCONSIDER THEIR VOTE. Posted on April 4, 2018 by Rachel Gartner | Comments Off on 4/5/18 Road Closure! Petroff Road, from Du Quoin Street to Central Street, will be closed to traffic from 5 a.m. Thursday morning until 4 p.m. Friday afternoon per the Benton Water and Sewer Superintendent. We’re sorry for any inconvenience. Thank you! Comments Off on 4/5/18 Road Closure! 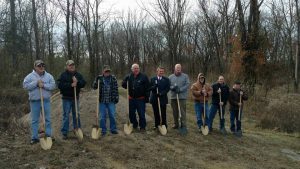 *The City of Benton broke ground on their new Waste Water Treatment Facility on December 15, 2016. The plant is set to be complete in 2018. Construction of the replacement of the Benton WWTF is financed by the Water pollution Control State Revolving Fund (SRF). The SRF program is administered by the Illinois Environmental Protection Agency and receives a portion of its money to fund these types of projects from the U.S. Environmental Protection Agency. This project includes construction of a new wastewater treatment facility which includes a headworks with grit removal, an oxidation ditch, 2 clarifiers, UV disinfection, a sludge pump station, sludge digester, sludge handling facilities and lab building. 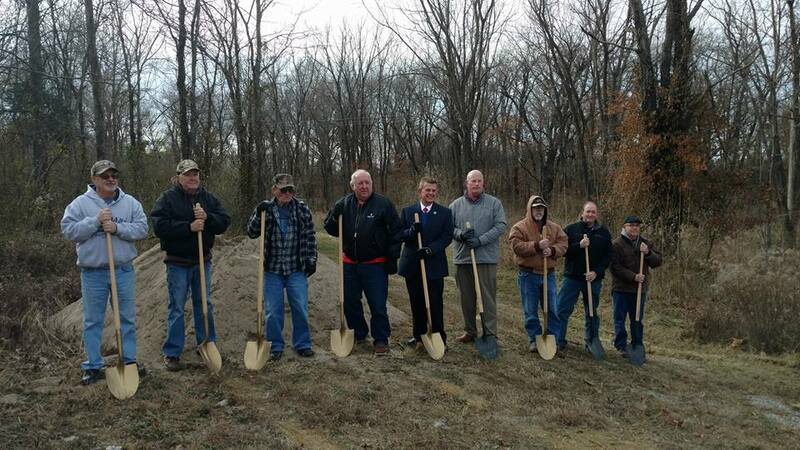 Once complete, it will improve water quality in the environment for area residents and businesses in Benton by improving the discharge quality from the wastewater treatment facility. SRF programs operate in each state to provide communities the resources necessary to build, maintain, and improve the infrastructure that protects one of our most valuable resources: water. Posted on August 31, 2016 by Brook Craig | Comments Off on LIFTED BOIL ORDERS! ALL BOIL ORDERS FOR THE CITY OF BENTON HAVE BEEN LIFTED! The City of Benton wants to thank its citizens for their patience and understanding during this time. There are no boil orders for the City of Benton at this time. Thank you again! Comments Off on LIFTED BOIL ORDERS! 1. East Smith from North McLeansboro to Frisco Street. 2. North Main from Park Street to Petroff. 3. Webster Street between South Mcleansboro and Brinley. Currently the City of Benton is experiencing major problems with our water lines. We have had several breaks all over town. We are working as fast as we can to get these issues resolved. If you have been without water or have experienced low water pressure, you will be under a boil water order. Please call 618-439-6131 for any questions. We apologize for any inconvenience this may have caused.